It takes up to £300 per month on average for one national missionary to be fully supported through GFA World. By pledging £25 per month to GFA’s National Missionary Programme, you would be partnering with these missionaries and impacting Asia together with them. 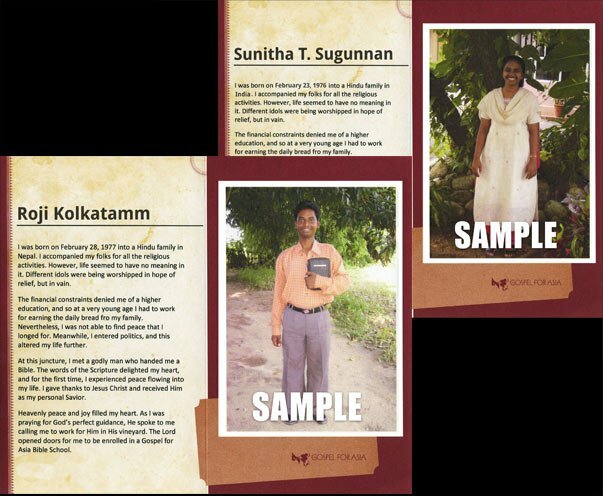 You will receive a photo and the personal information of a missionary you can pray for, for every £25 pledge you make. If and when we are notified that your missionary no longer needs support from GFA’s National Missionary Programme, we will send you the photo and testimony of a different missionary who is in need of support. What does my £25 pledge provide? While it takes up to £300 to fully support one national worker, your £25 pledge is one part of the programme that helps provide for our brothers’ and sisters’ ministry needs as well as living and family expenses. Your prayers will make a significant difference in your missionary’s life. It’s through your prayers that your missionary will see breakthroughs in his or her ministry; it’s through your prayers that people in the areas where he or she serves will come to realise the love of Christ; it’s through your prayers that your missionary will be sustained and able to press on when hardships arise. We'll be glad to assist you. Call us at 0161 946 9484. 100% of what you give to support GFA World’s National Missionary Programme will be transferred to our mission partners. Since the ministry began, we have sent 100% of what you give toward supporting national missions to the nations we serve and have trusted the Lord to provide for our overhead costs in the UK. At the same time, we do our part to keep these expenses very low. For instance, our UK office staff members raise their own financial support to cover their salary, helping keep our overhead costs at a minimum.